What are the best Waste Removal Bags? All responsible dog owners should clean up after their pets. Most pet owners use waste removal bags to dispose of unwanted dog poop. Being in the pet waste removal business, we know a few things about pet waste removal bags. We know that a small thin bag is the often the only thing between a pet owner’s hand and a piece of poop, so choosing a good bag is important. We rounded up several popular dog waste bags and put them to the test. These premium bags have a lot of great things going for them. The first thing I noticed is the texture. The Original Poop Bags ® boasts about their materials and it shows. These bags are made up of a combination of plant and recycled materials. The texture reminded me of a balloon. These bags seem to have quite a bit of give to them, and they hold up well. The sticker holding the roll together was a little stubborn at first, but it ripped before the bag did. Another nice feature from these bags is that they are like individually numbered in the roll, so you won’t be caught low on bags if you keep them in a dispenser. You’ll always know how many bags are left in the roll. These bags were by far the best bags that I tested. 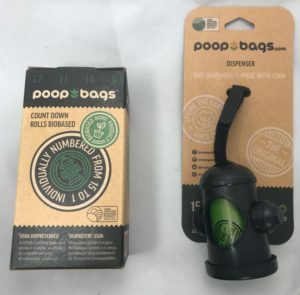 Original Poop Bags are available on Amazon.com or on their website. Dimensions: 12″ tall 8 3/4″ wide. I found these budget bags at the dollar store. They feel very thin and flimsy. These bags rip fairly easily. I ruined the first one when trying to remove the strip of tape that holds the roll together. I don’t think these bags would hold up in a pocket with keys or anything else, but they are fine inside most dispensers. Even if you do get a few ripped bags per roll, they’re still cheap enough that I don’t mind. It’s tough to beat the price of 1.2 cents per bag. I was unable to locate any additional information about these bags. The company does not have a public website, so if you have environmental concerns, I would encourage you to look elsewhere. GreenBrier Kennel Club Bags are available at Dollar Tree. Dimensions: 13″ tall 9″ wide. The Animal Planet biobase bags are a perfect example of form over function. These were definitely the worst bags of the bunch that we tested. I don’t think the good people over at animal planet did much quality control. These bags are non toxic and BPA free, but that’s where the good characteristics end. I had issues from the start with these bags. The sticker holding the roll together had far too much adhesive on it, and I have yet to open a roll where the first bag didn’t end up with a hole in it from trying to remove the sticker. The perforation between bags is sub par as well. When combined with a bag that tears easily, it’s a recipe for lots of bags with holes, rips and tears. Unlike the dollar store bags, these aren’t a particularly good value either with only 12 bags per roll. Dimensions: 13″ tall 8.5″ wide at the top and 5″ wide at the bottom. 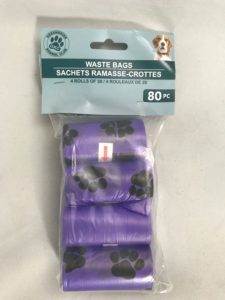 These high end pet waste bags were definitely a winner. 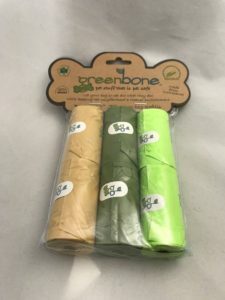 Even though they are made from biobased and recycled materials, the texture was similar to a balloon, and the bags stretched as needed without tearing or ripping. They also seemed to lock in the odor well – a very handy feature when the nearest trash can is far away. These bags also have a unique shape. The top of the bag is the standard 13″ width and easy to get your hand into. The Bottom seam, however is only 5″ wide. 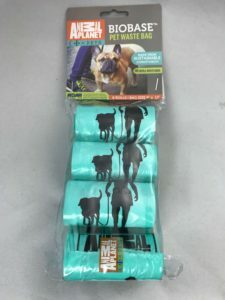 This makes it really easy to pick up pieces of dog poop and tie off the bag without risking any messes.